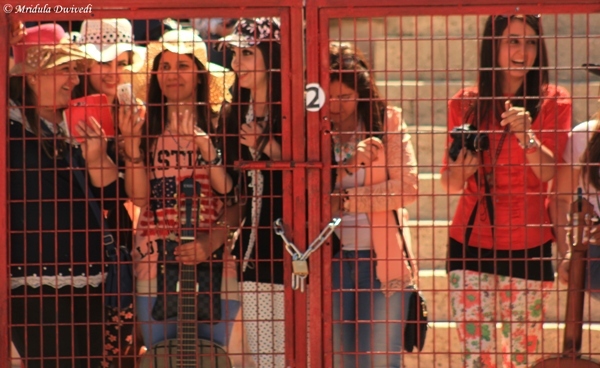 My excitement knew no bounds when I was invited to Jordan to cover the Pope’s mass at Amman Stadium. 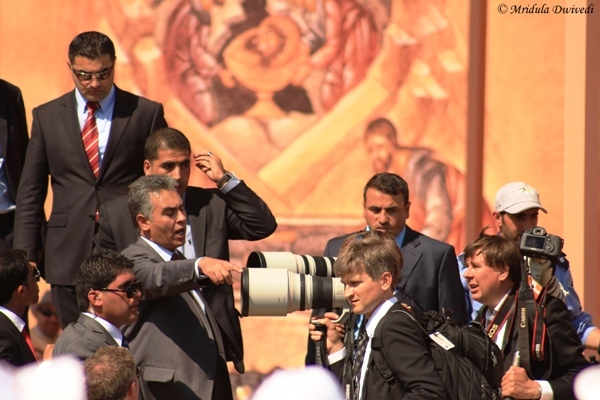 I was also quite realistic about my chances of actually photographing the pope. On the D Day, the media movement started quite early in the morning. We went to the cultural center at Amman. After a security check we were allowed to board the media bus, which would take us to the venue, Amman Stadium. When we reached the stadium, at that point in time there were still some empty seats in the main ground. All the announcements used to happen in the local language. However, the choir sang in the universal language of beautiful music. The giant screens would show the movements of the pope elsewhere in the city. At one point our guide told us that we should go near the boundary as the pope was about to arrive and he would go around the stadium in a open vehicle (dubbed ‘popemobile’ in various media articles) and we might get to see him at close quarters. There were people on both side of the fences. The invited guests and the media was seated in the football field and was closer to the main venue. My allocated seat was at an angle and far far away. 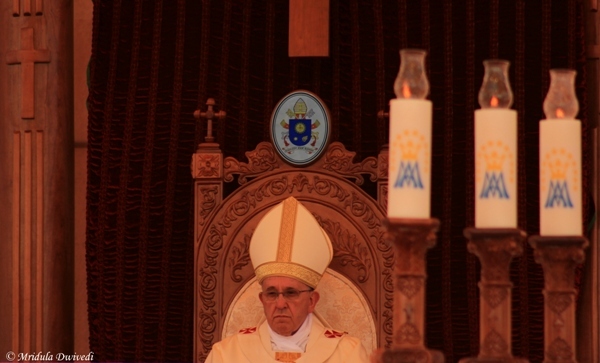 I was not sure if they would let me move closer once the pope arrived. So, photographing him while he was going round the stadium was my best bet. By the time I reached the fence, the front row was already gone. I saw some journalists standing on chairs and I copied them. I too stood on a chair bringing it as close as possible to the front row. 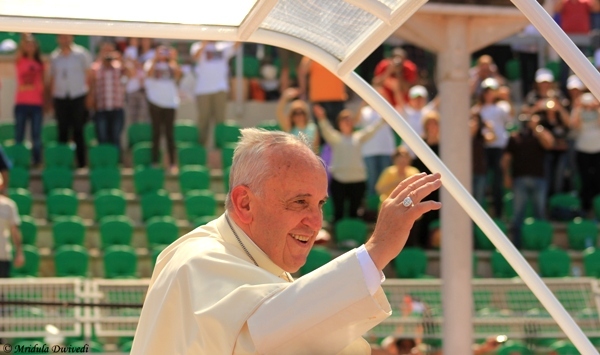 My original plan was to shoot a video while Pope Francis was far away and then click stills. I did try to execute it, but later there was nothing in the video! While I was switching cameras I realized my hands were shaking badly. Then I zoomed in and clicked the pope in continuous shooting mode. When his mobile passed to the far end, away from my vision, I looked at the pictures on the screen. And then I let out a scream of joy because I did manage to capture the pope! There was a festive atmosphere in the stadium. 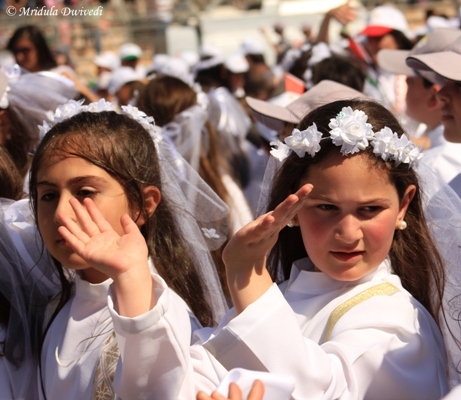 School children dressed in white were cheering the pope. There was a big group of priests too in the main arena of the stadium. I just tried my luck trying to see if I could click pictures of the pope from a closer distance. As I said earlier my own seats were far far away from the stage. I soon hit the first chain of volunteers and I timidly stood there. In a slight scuffle, I showed them my media badge as a precaution. They immediately gave me way, to go further ahead! 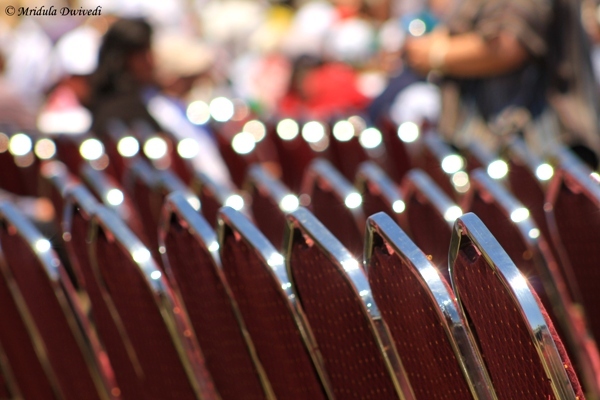 Next time if I ever find myself at such an event, I am going to ask instead of just standing like a frightened mouse! The only people who got to go on the stage briefly were rumored to be from the pope’s own media team. I also read that the plane in which the pope and his team travels is informally called Shepherd 1! There were many media people at the spot from where I was shooting. But people were quite accommodating of each-other. 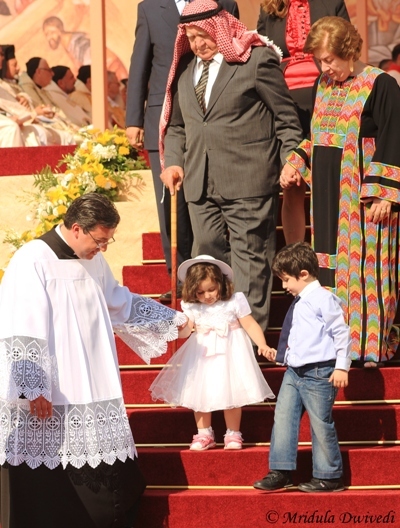 At one point a group of people went on to the stage to present offerings to the pope, this cute girl was one of them. His brother climbed up again to get her little sister down safely. The volunteers and the security were well trained. There were instances when they would request us with folded hands to comply with some request. At times they asked us to kneel down and shoot so that the people seated behind could see the mass uninterrupted. 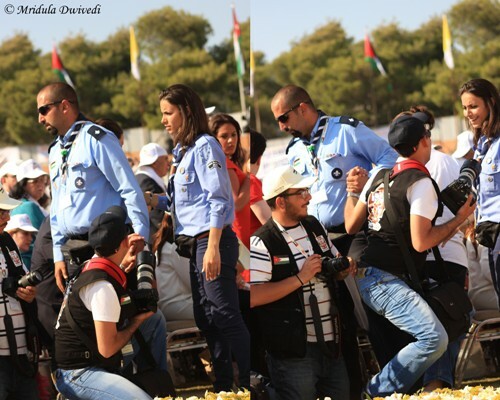 It was only once that a security personnel took a photographer by hand and put him back. The girl laughing would almost always make request with folded hands. It was only when all that failed they took the photographer back physically! For me it was such an awesome experience, after all it is not every day when I go masquerading as media and get a chance of photographing pope! Wow it had to be amazing to even get that close to The POPE, This was a great read and loved your photos. Well narrated and lovely pictures. Yes Deepak, only I want more such opportunities! I am very curious to know why you were asked to cover this event! It was a great experience Seeta. Wow, it must be an interesting experience.You managed to get good pictures. Bikram 😀 These posts write themselves! My effort is minimal. Wow! This must have been a memorable experience. Good clicks as well. Thanks for sharing! 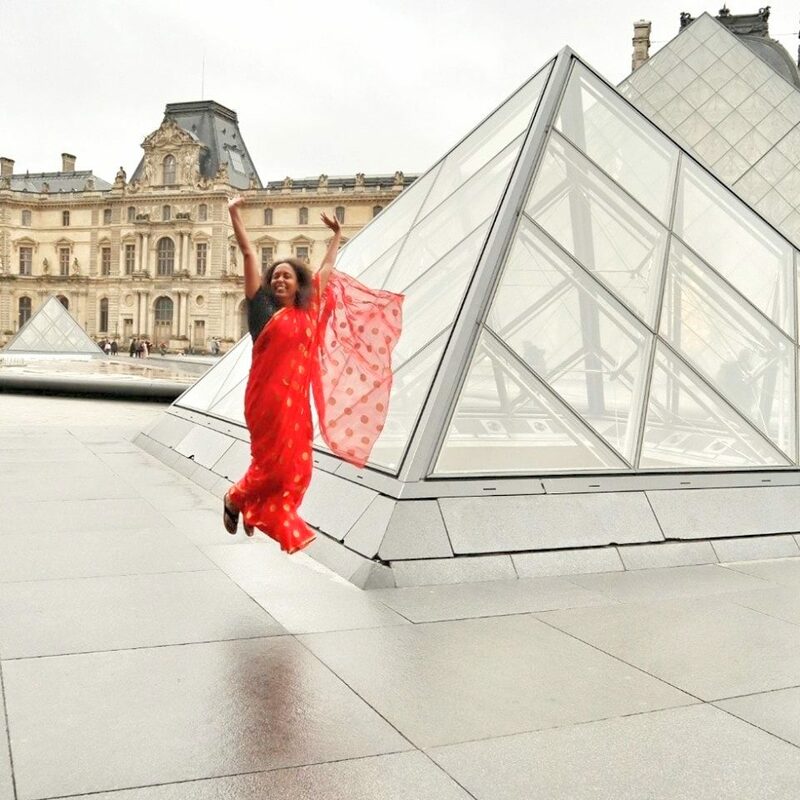 It was a memorable experience for sure Parul. GREAT PICTURES AND ENLIGHTENING CONTENT! THANKS! Thank you so much for stopping by and kind comments. Yes Lady Fi, it was a memorable day. Yes Maniparna it was an experience of a lifetime!